Transport Secretary Justine Greening has confirmed the government's approval of the High Speed Two (HS2) rail link in a statement to MPs. The coalition government has had a "laser focus" on improving the UK's ageing transport infrastructure, Ms Greening told the Commons on 10 January 2012. "When it came to HS2 I could have made the easy choice, I could have gone for the short-term option, rely on a patch-and-mend approach, leave our railway networks overstretched, overburdened and less resilient," she said. She continued: "Let's be clear: the price for that would have been paid in lost business, lower growth, fewer jobs and more misery for passengers on a network that could not cope with the capacity." Phase one of HS2, between London and Birmingham, should be running by 2026, with a second phase - the so-called Y-shape - reaching Manchester and Leeds by about 2033, MPs heard. 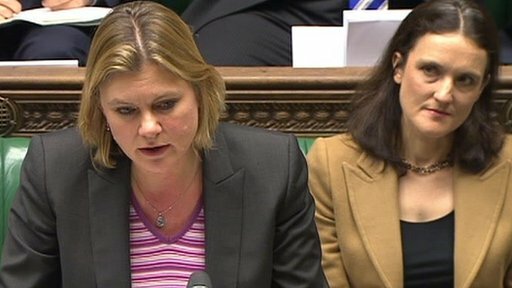 Ms Greening said she would introduce a hybrid bill to parliament covering the London to Birmingham link by 2014. Shadow transport secretary Maria Eagle welcomed the go-ahead for the high-speed link, describing it as a "vital project for the country". But Ms Eagle said there would be "disappointment" that the government had "fallen short" of legislating for the extension of the route to Manchester and Leeds. She said the government should "think again" about using a single piece of legislation to make HS2 available for the whole length of the route.